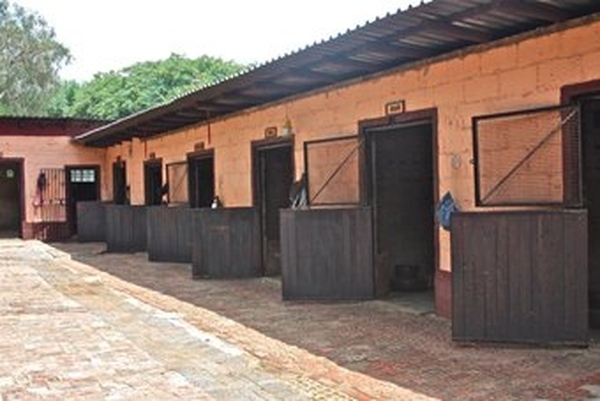 We are a friendly, well established, family owned and run horse livery yard, based in Midrand, Gauteng. Enjoy your Horsey time with us! 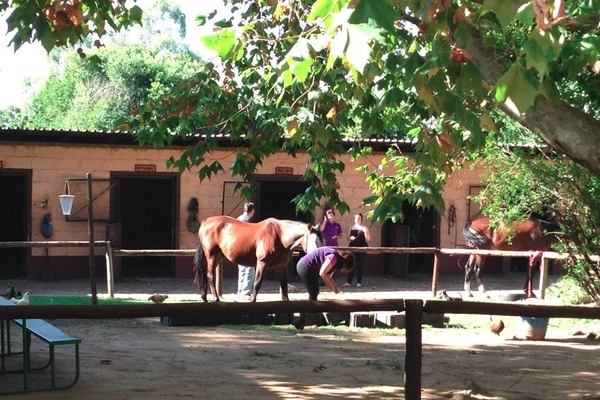 Our Offerings include horse riding lessons for kids and adults, Stabling / Livery and Courses. Visit our FACEBOOK page OR e-mail us or call us. Welcome to our Horsey Family! A warm welcome to Glen Austin Stables, one of Glen Austin’s premier livery yards and riding school. 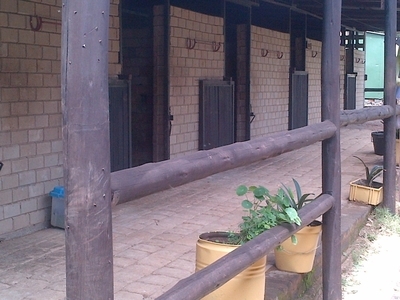 We are a friendly, well established, family owned and run horse livery yard, based in Midrand, Gauteng. Our owner and manager since 2007, Pam Botha together with her dedicated and trained staff, offer you peace of mind stabling for your horse and a social, relaxed and encouraging environment for you. We pride ourselves on our professionalism, quality of service and impeccable standards. You’ll find a welcoming and enjoyable atmosphere awaits you and we are on hand 24/7/365 to care for you and your horse’s every need. ...everything you would expect from a quality livery yard, including well maintained stables, group or individual paddocks, great exercise facilities and riding areas, well equipped and secure tack and equipment rooms and professional yard and stable management. Visit our FaceBook page, send us an e-mail or call us for more information regarding our high quality of training, both theory and practical, our riding lessons, livery / stabling options and pricing, or to join us for our next event. Why not join our mailing list to be kept in the loop with new developments at Glen Austin Stables? All our instructors have extensive experience, whether it be riding lessons for kids, teenagers or adults from beginner to advanced levels. Top service Livery / Stabling for 28 horses, with full facilities including lunge ring, large arena, secure parking, clubhouse and more. Apart from riding lessons and horse training, we schedule workshops and courses in grooming (basic and advanced), balanced horsemanship (theory and practical) and distance learning theoretical courses for beginner and advanced riders. We offer a full livery service which covers 24/7 personal care of your horse and we have a selection of brick and wooden stables for 28 horses for you to choose from. Glen Austin Stables is a secure property and has a gated main drive access. Besides normal daily routine care we will also take care of arranging all of your horse’s weekly and monthly needs including scheduled vet, dentist and farrier visits, diet and nutrition management, de-worming programs and vaccination schedules. Our management and staff are always accessible and we strive to create an environment that will maximise your use and enjoyment of all our facilities, the time spent with your horse and your riding enjoyment. You’ll find a welcoming atmosphere, with friendly management and helpful staff. We have a yard office, client facilities including a tea and coffee bar - all set in relaxed and peaceful surroundings. We hope that you and your horse will enjoy spending time with us. Our management and staff are here to ensure that you do. If you are considering making use of our services, please familiarise yourself with our "Yard Rules" (click to view). To view and/or print the Livery Contract & Prices, please click here. We offer structured riding lessons for beginner to experienced riders (or a rider returning to the saddle) wanting to gain skills and confidence in horse riding or in a specific discipline. 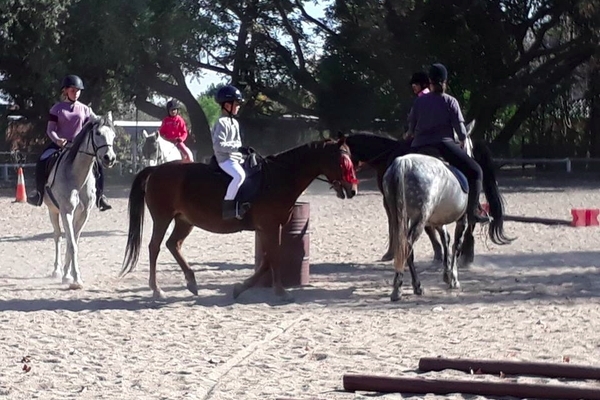 Our lessons are structured around teaching you balance, improving your confidence and providing you with the horsemanship skills to facilitate a well rounded and trained rider. Don’t have your own horse – not a problem – we have well trained and kind ponies and horses that are chosen for their calm temperaments which we will match to you so ensuring you a perfect mount to meet your skill level. Perhaps even consider leasing/baiting one of our horses *click here for more details*. Our instructors are well trained, kind and understanding to ensure you learn to your maximum capabilities while at the same time having fun! Beginner riders typically start off on a lead rein and lessons include developing balance and basic skills at walk, trot and canter. Once you have developed the required skills and independence off a lead rein you will progress to more advanced dressage and/or show jumping training. Progress takes time and for confidence and skills to develop it is vital that you do not rush yourself or your child through the basic levels. Whether you have your own horse or you are using one of ours we will guide you through the level skills required to achieve the best possible results from you and your horse in the discipline of your choice. Private lessons are offered daily for all abilities and are ideal for riders who would like to work intensively on their individual goals. We also offer semi-private lessons for groups of 2 or 3 at discounted rates. So bring a friend! All riders must wear riding helmets to the current safety standards and riding boots or closed shoes. Shoulders must be covered please, so no strappy tops; short sleeved t-shirts are fine. Your legs must be fully covered whilst riding, so we recommend jodhpurs, leggings or tracksuit bottoms. We don't advise jeans. Long hair must be tied back and no jewellery please. Feel free to call us if you want to chat about what to wear, but don’t worry, to get you going quickly, we have riding helmets available until you can get your own. Do you know of someone who would enjoy a “once off” lesson or riding experience? Why not consider purchasing a gift voucher for them or even better – spoil yourself! We have different options available for you to choose from! Call or e-mail us for more details. We host top instructors within their fields and hold regular workshops and clinics in the various disciplines that are of interest to our riders which including show jumping, dressage and horsemanship that we encourage all our riders to participate in. The workshops and clinics are not included in your lesson fees. We host regular training shows in dressage and showjumping with certified judges to assist you to gain show experience in a relaxed and friendly environment.To be informed of our events, sign up for our newsletter. We have a daily lunging schedule to lunge or ride livery horses to increase their learning abilities and to provide continuous schooling. Our pricing starts at R2,000 for half baiting and ranges from R4,000 for full-baiting. Please give us a call – we will be happy for you to pop in and meet us and our horses/ponies and to discuss your specific requirements. Nobody likes too many rules, we all like to rely on our own common sense. Sadly though, we in the equestrian community don’t all share the same expectations and understanding of how things should be done around the yard. At the risk of pointing out the obvious, we have compiled a list of rules and guidance on how the livery yard is run and what we might expect of each other. Our aim is not to be unfriendly, but to be clear on our standards and to provide a livery yard that is clean, safe and functions smoothly to the benefit of all clients. The Yard will be available to owners to access from 7:00am any day. The Yard means all areas and facilities used by the Owners/Baiters and Clients of Glen Austin Stables, which includes the stables, riding school, arenas and paddocks. All Liveries, Baiters and lesson clients are required to sign an indemnity form. Staff will be available for assistance between the hours of 8.00am and 5.00pm Monday to Sunday. Please do not order or instruct stable staff or grooms – any specific order or instruction must be directed to Glen Austin Stables management. Children under the age of 14 are not permitted in the yard unless they are under the supervision of an appropriate adult. Even the calmest of horses can be unpredictable. Everybody entering the yard must take care and follow our guidance when given. Do not feed the horses; it can lead to them acting aggressively and biting. Dogs are not allowed at the Yard at any time. The Yard has a no smoking policy in and around the stables, store rooms and tack room. Any injuries, accidents or damage must be reported to the Yard Manager as soon as possible. Do not use or take other peoples tack or equipment without their prior consent. Prams are not permitted in the yard. Please leave them in the clubhouse area. Riding without a riding helmet and suitable footwear is not permitted at any time. All animals have the right of way. Be responsible and drive slowly. Please ensure that the toilet lights are switched off, taps are not left running, and litter is thrown in the bins provided. All horses must be vaccinated against equine flu, tetanus and African Horse Sickness. 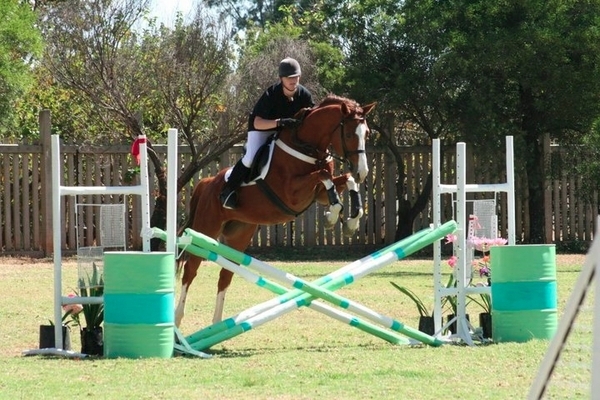 You may only turn out horses into paddocks designated to you by Glen Austin Stables management. Unless expressly agreed with Glen Austin Stables management, no horse may be left alone in the paddock or any of the paddocks at the end of the day. The Yard reserves the right in consultation with owners to plan and manage herd size and composition together with paddock allocation governed by paddock conditions. Shared paddocks may result in horseplay injuries. Unless the weather dictates otherwise, horses are turned out before 8am and brought in by 4pm. Turnout will be weather dependant. If poor weather prevails, we reserve the right to close the paddocks completely until the conditions improve. It is advised that Owners / Riders should wear their riding helmet and gloves when turning out and bringing in their horses. Subject to the rules and understanding below, the arenas are available free of charge to all Liveries and Baiters at all times on a shared basis for use between the hours of 7am and 7pm throughout the year. During periods of high demand livery clients are requested to keep their riding session to a maximum of 45 minute sessions per rider / horse. We ask that you consider the needs of other Glen Austin Stables clients. The riding school has priority of usage and may use the facilities at any time in accordance with its needs without notice during its normal opening hours and for special events. The riding school will attempt to give reasonable notice of its requirements in advance, but all Liveries are advised to check at the office for availability. Whilst watching a lesson please keep noise and sudden movement to a minimum. Do not try and communicate with a rider whilst a lesson is in progress. It is important they concentrate fully on riding their horse. Free usage is not exclusive usage and other riders may enter the arena at any time provided that there are no more than 6 riders in the arena at any one time. If the arenas are being used by individuals to school their horses, under no circumstances must jumps be put out by other individuals until the schooling session is finished. Jumps / trotting poles may be erected for lessons/exercise but must be removed at the end of the individual session and stored securely. Private lessons are not permitted in the riding school arenas at any time unless the visiting instructor has booked in advance and paid for a lesson slot at the office which will give exclusive use to the rider at that time. All riders are entitled to the peaceful enjoyment of the facility and as such all helpers; riders and spectators should be courteous and helpful to each other. Keep noise to a minimum. In taking lessons or riding/handling horses at Glen Austin Stables, I assume any such risk of injury or death and further, I voluntarily release Glen Austin Stables, its instructors and agents from any responsibility on account of injury or death I or my child or ward may sustain while receiving instruction or while riding in connection therewith, and I agree to indemnify and hold harmless Glen Austin Stables, its instructors and agents on account of any such claim. Likewise I accept full responsibility for friends and visitors accompanying myself to Glen Austin Stables and hold Glen Austin Stables harmless on account of any claim arising from loss/injury or death of my visitors. Glen Austin Stables, its instructors, and agents are not liable for an injury to, or the death of, a participant in equine activities resulting from the inherent risks of equine activities or for any other reason whilst on or off the the property. Furthermore, I hereby release Glen Austin Stables owners, instructors and staff from any responsibility on account of any loss or damage to my or my visitors vehicle or my/their goods whilst on the property. I understand that this is a working farm and horses/dogs and other animals roam free and could damage vehicles and goods.